Chura Band are an ensemble of musicians from Eritrea, currently seeking asylum in Israel. 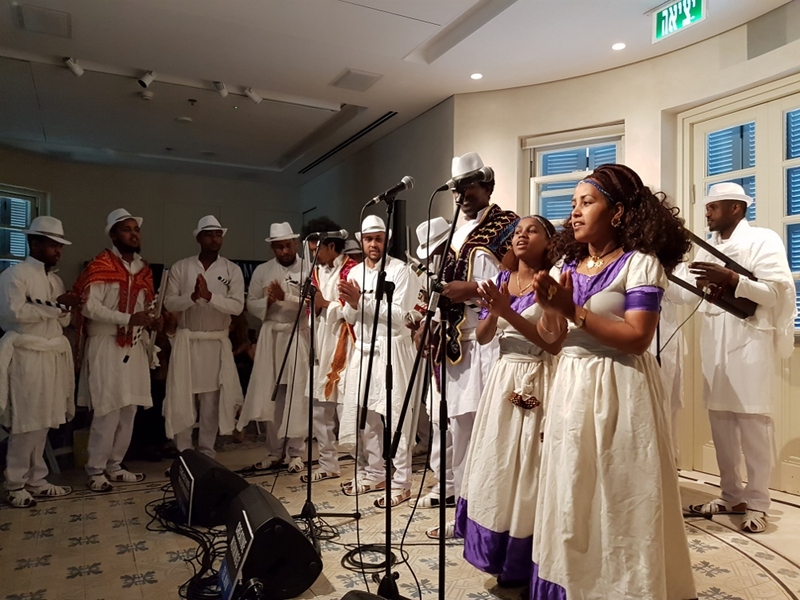 They sing in Tigrinya, the language of their home, both traditional songs and original songs that describe the current situation in Eritrea and their desire for a better life for their people. Their music is rhythmic and beautiful. Even though I cannot understand the words, I can feel the spirit. Creative Mornings Tel Aviv hosted the Chura Band on March 15, 2018 at the Edmond de Rothschild Center, and it was a moving and exhilarating experience. Listening to the band, swaying to the music, listening to their personal stories goes beyond politics and economics. These are people who have endured and lost so much, whose daily lives are full of hardship and uncertainty, who take a risk every time they venture outside. Yet they have the courage of their convictions and hope for a better life, not only for themselves, but for their sisters and brothers in Eritrea. They work for change through their music, daring to sing the truth. And they make such beautiful music. Chura Band is one of several bands that will be participating in the Music Against Deportation concert at Bascula on April 1, 2018. The Creative Mornings event can be heard in full on their website. Since most of the dialogue is in Hebrew, I’ve translated a selection of the discussion*, to share with you the story of one of the band members, in his own words. We [the band] began in 2013. We strive for a good life and democracy in Eritrea, that is why all our songs are against the dictatorship in Eritrea. We write songs so people will know what is happening in Eritrea, so they will understand. That is why we do what we do. We have over 30 songs. We have a YouTube channel, website. That is why we make our songs. We also write songs about our lives here, how we got here, about our lives in Eritrea, what life is like in the Eritrean prison. The government in Eritrea says there is no prison, everything is fine. That is why I am on a blacklist in Eritrea. If someone asks me – can you go back there? I cannot go back. Ever in my life. Until there is peace. If I am taken by force, by plane. I might die on the way. “I came here in 2011. First of all, I said thank you to the soldiers on the border. We arrived from Sinai at 1am and the Egyptian soldiers did not want to let us cross. We ran. There are about 200 meters between Israel and Egypt. They shot at us. Three of my friends were killed. The Israeli soldiers gave us light, you know, with floodlights, otherwise we would not have seen what was ahead of us. They also called out to us: Come here, come here, Israel. To give us strength. We are here, but the problem is… first of all, I want to thank them. But afterwards, what happens? I was in Saharonim for two weeks. There were all sorts of questions: how did you get here, why? Then, after two weeks, they just gave me a bus ticket from Beer Sheva to here. I don’t know what the Israeli laws are, I don’t know how people behave here, what am I supposed to do? What do people do in the morning, in the evening? I don’t know. They said go to Tel Aviv. Where is Tel Aviv? They said the bus driver will take you. You’ll see lots of people. OK. I lived in a dictatorship for six years as a soldier, I was a soldier in Eritrea. I ran away at 3am, four hours on foot. Ethiopia, Sudan… I don’t know what Israelis are like. White? Or yellow like me? I said. OK. I got to Tel Aviv, the Central Bus Station. I am not familiar with anything. There are elevators in Eritrea, but I had never see an elevator that goes down like stairs. Now I’m at the Central Bus Station and people are going down. How will I go down? Maybe I’ll fall. Later we came here. I don’t know anyone. I see some Eritreans, but maybe they are Ethiopians. How will I talk to them? The language is the same, but how will I talk to them? So for two nights I slept on cardboard in Levinsky garden. I didn’t have a shekel or anything. I went into a store and they gave me a pita with humus. We ate. Two days, and we don’t know anyone. Then I met someone I know from Eritrea on his way to work. I said: Hey what are you doing here? That is how we began life here … We don’t know the law here. That’s how we began… life… it’s hard. But we work. I sleep without pants here. In Eritrea I used to sleep with my pants on. Why? Because when they come, I’ll run away. Here, it’s a democratic state. There are some people who hate us, but what can we do. There’s nothing to do. Until there is peace and democracy in Eritrea, this is my life. Even if I suffer, what can I do? There are people who don’t respect us, who won’t give us anything, who don’t even say hello. But what can I do? It’s hard to live here. I have asked for asylum but they didn’t answer me. But that’s what there is. But a lot of people are helping us here. Perhaps you have understood me a little. I would like to add… what we have been through to get here, it’s more than I can tell. It cannot be explained. We can’t explain it to you. If you knew or understood what we went through to get here we would not be in this situation. We would not have this problem. Many people died on the way here. They wanted to come here. They left their country… many of our friends were lost along the way. Many people. It is beyond telling. In Sinai from our country, getting out of our country if you are illegal – you may die. If they tell you to stop and you don’t stop… It’s easy to say ‘we went from Eritrea to Ethiopia then through Sudan, then Egypt’. It’s easy to say it, but we had many problems along the way. Many people. It’s hard. What we endured was really hard. If you knew what we went through, we would not have a problem here, you would accept us. I think. But it’s hard to know what another person experiences, only he knows. Music against deportation will take place at the Bascula (72 HaRakevet) on Sunday, April 1, 2018. Doors open at 19:00, admission is free. Details on the Midnight East Live Music Calendar. *The translation was made to the best of my ability, based on listening to the recording of the event. If there is anything I have misunderstood, or any errors in the transcription, please send me an email, and it will be gladly corrected.